The San Andres Mountains and pieces of construction equipment are reflected in the glass windows of Spaceport America near Upham, N.M., in May. Despite construction delays and difficult working conditions in a remote area of the desert, state officials say New Mexico is committed to seeing the project succeed. NASA's shuttle program ends when Atlantis comes back to Earth this week. It's not the end of American space exploration, however; it's the beginning of a new phase in commercial space travel. For now, American astronauts will be hitching rides to the International Space Station on Russian Soyuz capsules. NASA and President Obama hope that won't be for long; they're counting on America's private sector to come up with a new way to get people, equipment and supplies into space. That means there's a lot of money to be made in shuttling back and forth to the space station, and several companies are competing in a new race to space. Defense contractors like Boeing are in the game, as is Virgin Galactic — the private space tourism company owned by British business tycoon Richard Branson. Whatever the new space vehicle is, it'll need a place to park. Enter Spaceport America, a company building a kind of airport for spaceships. According to the people behind Spaceport America, the future of commercial space travel begins near the tiny New Mexican town of Truth or Consequences, where America's first commercial spaceport is under construction. Just outside of town, highway signs bear little yellow stickers in the shape of a rocket. "It's kind of a mystery. We don't know who's putting those there," says David Wilson, spokesman for the state of New Mexico's Spaceport Authority. Really, he insists, it's not the spaceport. On a 45-minute drive deep into the desert, miles of spiky grasses outline the horizon — interrupted by the occasional bison. The sky above is powder blue and clear of clouds. For decades, it's been the perfect place for pioneering rocket scientists. "Robert Goddard brought his experiments and rockets to the New Mexican desert in the '30s for the same reasons," Wilson says. "There's this incredible weather window; there's no population out here, and then you're a mile up from sea level. We have a saying around there, 'The first mile of space is free.' It takes less energy to get to space from a place out here like this." Plus, they don't have to worry about planes. The airspace is restricted, thanks to the nearby White Sands military installation. The first thing you see when you pull up to the construction site is a sign that says it will be finished in early 2011. The project is running behind schedule and over budget for a number of reasons. There isn't enough water, so they have to truck some in. There's no power, either, so they have to use generators until they can build a power station. Only one of the two highway routes is even paved. 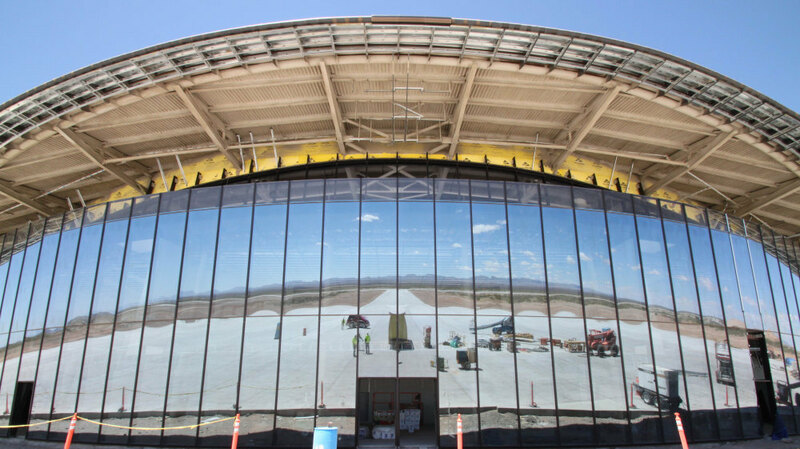 Still, the beginnings of a 100,000-square-foot terminal rises like a turtle shell out of the dirt and sand — lots and lots of sand. 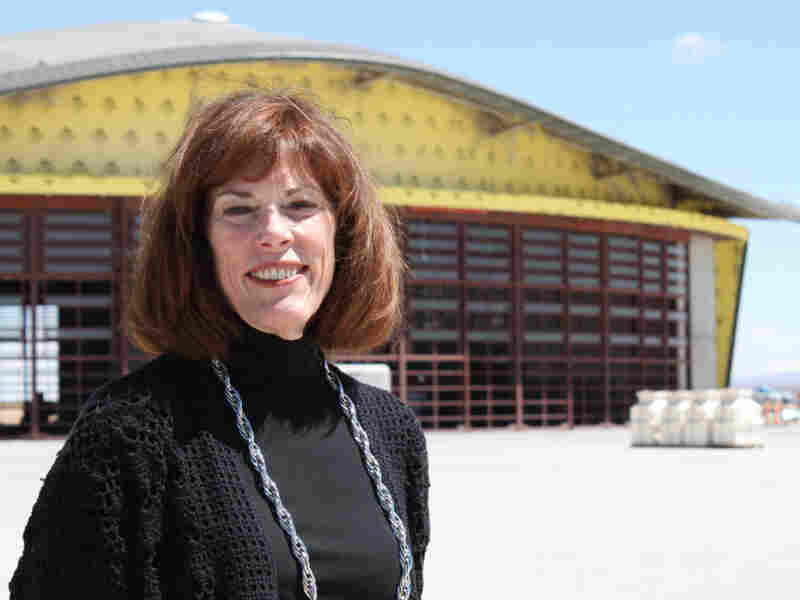 Christine Andersen, head of the state's Spaceport Authority, sees more. "I see a lot of tourists coming through here," she says. "We'll have a really fantastic visitor's complex. We also see some other venues. This is a fantastic place to enjoy the Southwest, if they want to do nature hikes. Maybe we'll even have an art gallery of New Mexican art in our visitors' experience. So that's what I see. I see a hub of activity and excitement and interest." Andersen was appointed by Susana Martinez, New Mexico's new Republican governor, who replaced several board members and called for audits of the Authority's spending. New Mexico Spaceport Authority executive director Christine Andersen believes if you build a spaceport, the tourists will come. The state has already poured in $200 million into financing the spaceport. Much of that was approved in 2007, when New Mexico was flush with a $500-million surplus. This year, the state expects a $450-million deficit. Martinez wants the private sector to pick up the tab for the spaceport when state financing winds down in 2013. It's Andersen's job to get more businesses to take up residence in the spaceport so it will eventually pay for itself. "Our anchor tenant is Virgin Galactic, so we already have one very strong customer coming to the spaceport," Andersen says. As the shuttle program winds down and military budgets tighten, Andersen thinks it's the right time and place for the spaceport. According to the company's website, tickets for a Virgin Galactic trip into space cost $200,000. Some critics scoff at staking the state's job creation on what amounts to be a few, very expensive, carnival rides. "Well, that's the space tourism part, so those are the actual six passengers that get to ride in the spaceship," Andersen says. "We're going to have a lot of interesting other things that have to do with space, and I think people will be very excited about that." Of course, not everybody is excited. Dona Ana County Commissioner Karen Perez works for one of the two counties to vote on new taxes for the project — 25 cents on every $100 in sales. Altogether, Dona Ana citizens are investing $50 million in the spaceport. This looked like it was going to give us some sort of immediate return on our investment. We're still waiting to see a return. Perez says she was new on the job when state officials came around to make their pitch. She says they told her, "You're going to see all kinds of side jobs that come in, or ancillary industry that's associated with the spaceport." "We said, 'Really? What's that going to be?' 'Well, payloads and electronics, places and people to work on the motors.'" Then during construction, Perez says, they were promised local construction jobs. Afterward, there'd be more jobs. Instead, she says, local construction firms were outbid by larger outfits — some from out of state. Meanwhile, the road to the spaceport from Las Cruces in Dona Ana County is still unpaved. Perez says the county is physically and economically cut off from the spaceport — at least for now. "I think one of my biggest regrets is allowing ourselves being rushed into an election," she says. "A lot of the information, it was very glamorous and very exciting. And there was a lot promises on jobs, again, for construction. It was the very beginning of the recession, and people were worried about how they were going to survive." "This looked like it was going to give us some sort of immediate return on our investment," she says. "We're still waiting to see a return." But companies aren't wasting any time selling the dream of private space travel. Carolyn Wincer, head of Virgin Galactic's astronaut sales, says more than 400 people have already signed up for the ride. Apparently, the experience is worth the astronomical ticket price — at least as Wincer describes it. 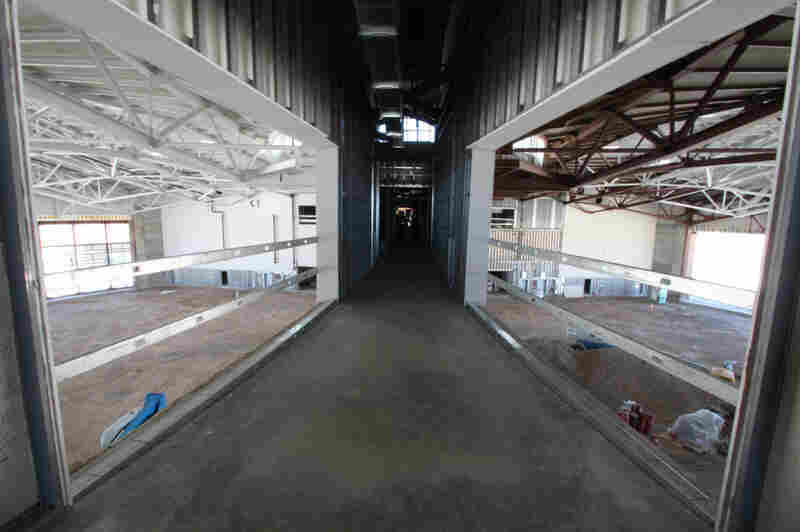 Space tourists will be able to gawk from this walkway at the hangar where Virgin Galactic will store its spacecraft. "Within 10 seconds, they're traveling supersonic, and in about 30 seconds, they're going almost 3 1/2 times the speed of sound," she says. "When the rocket motor ignites, they'll be pushed back in their seats by quite high G-forces and there'll be all this noise with the rocket motor right behind you. And they'll do that for around 90 seconds, right up and out of the atmosphere, vertically. And very, very quickly, the sky will change color from blue to dark blue and eventually into black." There's more. "So then rocket motor shuts off, and instantly it's completely silent, and instantly they're weightless," she continues. "At that point, they can unfasten their seat belts and float out of their seats and spend about four minutes floating around the cabin, enjoying that sensation of weightlessness." Touring the half-finished terminal for space tourists, Wincer shares some of the other plans for the spaceport. They're getting a license for a vertical launch pad as well as a horizontal runway. That could open the door to research and space trips beyond Earth's orbit. She says turning a profit with space tourism is an important part of the plan to boost the entire private space industry. "NASA [has] done a fabulous job, and they will continue to do so, but it's difficult for them," she says. "They've got a limited budget and the whole universe, literally, to explore. And so I think it's absolutely right that they be left to focus on things further afield — deep space, lunar exploration — whilst the private sector focuses on the near Earth stuff." "If we can show that it's profitable to be in the space business, it will attract more investment and it will enable to us to more quickly develop better technology," she adds. "Once you prove a concept — once you prove you can make more money out of it — it attracts more money and the technology improves, as well." As Wincer ducks under construction lights and steps over piles of metal and wood, she points out the future spot of mission control. She explains how all five Virgin shuttles will fit in the gaping space of the spaceport hanger below. What she can't say is when the first rocket load of ticket holders will take off.